The owner did not want the painting in her home and two Dutch auction houses declined to put it up for sale. 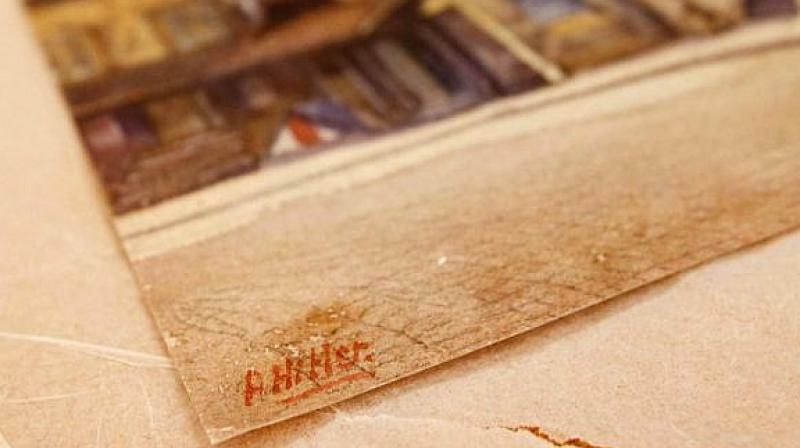 The Dutch national institute for wartime documentation said Saturday it has been given a rare watercolor painting by Adolf Hitler, believed to be the only one in existence in The Netherlands. The aquarelle — a technique of painting with thin transparent watercolors — depicting a tower in Vienna was donated to the Amsterdam-based NIOD institute by a woman whose identity was not revealed, the leftist daily De Volkskrant added. “The woman did not want the painting in her home and two Dutch auction houses declined to put it up for sale,” the paper said. It was donated earlier this year to the NIOD, originally set up just after World War II to create a national archive of documents relating to the 1940-45 Nazi occupation of The Netherlands. The unidentified woman’s father originally bought the painting at a stamp and coin market “for 75 cents and only realized when he got home that it was signed by ‘A. Hitler’,” the paper said. “After months of following an authentication process the… conclusion is: it’s an original from the hand of Adolf Hitler,” the NIOD said in a statement. “Between 1909 and 1913 Hitler made a living from selling painted postcards,” it added, saying the young dictator made an estimated 2,000 to 3,000 cards of which around 800 were known to exist today. By taking ownership of the painting the NIOD has prevented it from going onto the open market, its director Frank van Vree said. “I don’t want to sound patronizing, but it’s good that this type of thing does not get sold in an auction containing Nazi paraphernalia,” he told De Volkskrant. The Netherlands was occupied for around five years by the Nazis, who carried out a reign of terror, including deporting more than 100,000 Jews to death camps such as Auschwitz and Sobibor where they were murdered. The victims included world-famous Dutch teenaged diarist Anne Frank and most of her family. Most of Hitler’s artworks are now in private collections in Austria, Britain, Germany and the United States, and the US Army still has four works which it confiscated during the war, De Volkskrant said. Neither the NIOD, nor experts knew of any other of Hitler’s artworks in The Netherlands, it said.